When integrating a system into the Antec P180B chassis, one needs to be aware of a bit of a manufacturing quirck if that last slot is going to be needed. 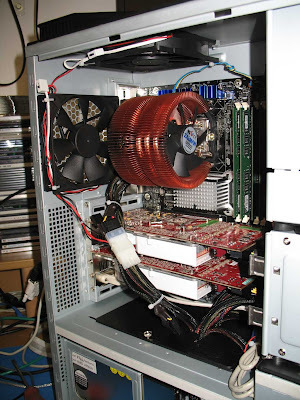 In this case, we put together an Intel based X6800 on an Intel BadAxe D975XBX motherboard. ATI X1900 CrossFire and X1900XTX PCI-E video round out the system. CoolMax provides 1 KiloWatt of power and Zalman will be keeping the processor cool. This is where we ran into the snafu. 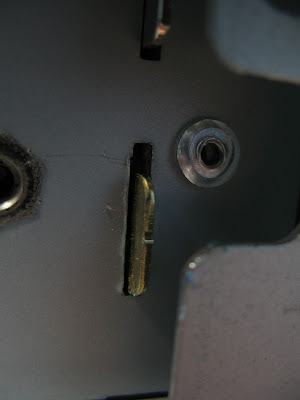 There is a folded piece of metal just behind the slot opening that the sound card's bracket should be passing through. On this particular build, there were a number of the hard drive rubber isolator grommets that were missing from the box. A call to Antec's support line and a few days later we had the requisite number of grommets to install the hard drives. Besides having good quality chassis products, Antec's post sales support has been really good to us when needed.